Might Droid Razr HD debut then? Sept. 5 is gearing up to be a big day in the tech world as Motorola and Verizon announced Friday they're holding their own event, concurrent with a scheduled Nokia/Microsoft Windows Phone 8 shindig. 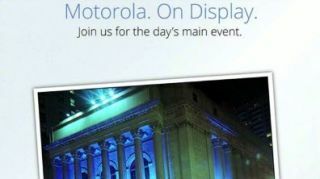 The phrase "On Display" is front and center on the invite, suggesting the Motorola event might be a big reveal for its long-hyped Droid Razr HD. Another clue are the stamps of both Motorola and Verizon on the invitation's end. Unless Motorola's been working on another smartphone with another carrier that no one has heard of, we anticipate the high-def device arriving early next month. TechRadar reported last week that a "very reliable source" talking to Hot Hardware said the Razr HD, along with the questionable Razr Maxx HD, have an October release date, but it looks as though that source was a bit off for at least one of these products. Though we can piece together what Motorola and Verizon plan to showcase at their September event, very little is known about the new Razr. The device is expected to run on Ice Cream Sandwich, have a 720x1280 display and dual-core Qualcomm Snapdragon S4 processors at 1.5 GHz. Other than some leaked photos, there's not much to go on when it comes to the Razr HD. Guess we'll just have to wait and see what September brings.